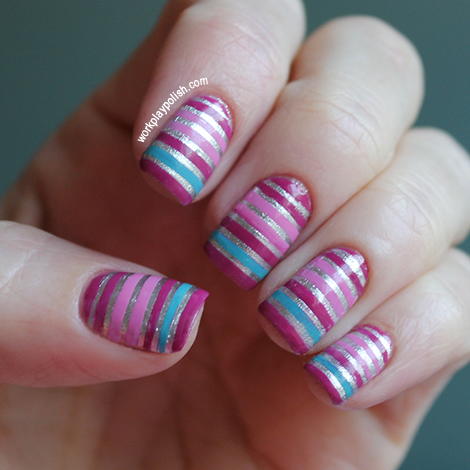 This striped mani was inspired by two sources. First, the striped manicure by the amazingly talented Mimi at Makeup Withdrawal. And second, all of the designs on gold and silver foil lately, especially this neon dot manicure from Emerald Sparkled. So I combined the two looks and this is what I came up with. I painted my nails two coats of Sally Hansen Xtreme Wear Celeb City and added a coat of Seche Vite. While that dried, I cut many short strips of striping tape and had those handy on the edge of the table. Using tweezers, I placed six parallel strips on each nail. Then used a nail art brush to polish on the color. (Zoya Shelby and Katy and China Glaze Flyin' High). I did one full nail at a time and took the tape off (with the tweezers) after each was totally painted. Then cleaned up and added another coat of Seche Vite. It really wasn't that hard. As Mimi said on Makeup Withdrawal, the hardest part was just getting the lines straight.